Drakshrama is located in East Godavari district of Andhra Pradesh state in India. This place is very famous for one of the pancharama temple, Draksharama Bheemeshwara Swamy and located in a green belt due the river Godavari. 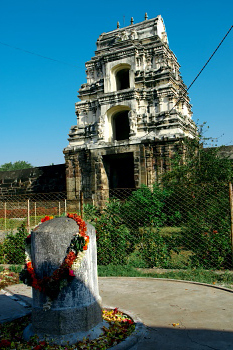 The temple (along with Kumararama Bheemeswara Swamy temple at Samalkot) has been constructed by the East Chalukyan king during Nineth century. 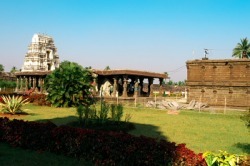 The temple also consists one of the Shakti peetha, Sri Manikyamba. Irrespective of the kind, people who perfom puja here will be free of their sins. Shiva Lingam is nearly 9 ft hight and the top part is seen at the first floor. 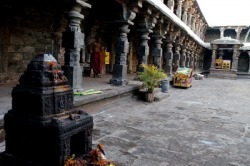 There are other small temples inside the main temple premises. To name a few, Praakara Bhairavudu, Viroopa, Natarajeshwar, Vaamana, Visheshwara, Dancing Ganapati, Dundhi Ganapathi, Goddess Kanakadurga and Goddess Annapurna. 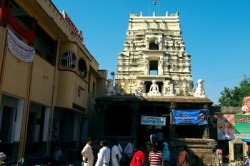 To the right side of Bheemeshwara Swamy temple, Kashi Vishweshwara Swamy temple (South facing) is situated. For performing puja (Abhisheka), water from Sapta Godavari is used as it is considered sacred. Devotees come in huge number during Kartika Masam (November-December) for performing puja in this temple. Grand celeberations can be witnessed during Janmadinotsav (Birthday) i.e during Margashira Shudha Chathurdashi. There is a choultry in the front side of the temple where free food is served for visitors. Travellers can relax here and refresh. Well maintained toilet and bathroom facility available. 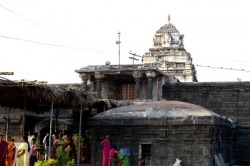 The maintenance of the temple is taken care by the Government of Andhra Pradesh. Photography is restricted inside the Garbha Gruham, allowed outside the temple premises. Dormitory facility available at a very nominal cost which is available at a distance of half kilometer from the temple. Bigger one INR 200 per day and smaller one is INR 100 per day. The temple timings are given below. Draksharama is situated just 6 Kms away from Ramachandra Puram in East Godavari District of Andhra Pradesh. Only bus facility is available to reach. Nearest Railway stations are Kakinada, Rajahmundry. Samalkot (junction) is one more nearest railway station where people can plan to get down in case they want to visit other places in this area. Few trains give stop at Annavaram also. Get proper information about the stoppage of trains in these stations as all the trains will not stop. Excellent bus facility is available from Kakinada and Ramachandrapuram. People travelling by train from any part of the country, get down at Samalkot. If they get train upto Kakinada, get down at Kakinada. People can reach Kakinada by bus also. The distance between Samalkot and Kakinada is only 12Kms. From Kakinada, Draksharama is 28 Kms on the way to Kotipalli. There are frequent buses available to Kotipalli. Additional places of interest around Draksharama include Samalkot (Pancharama, Kumararama Bheemeshwara temple), Annavaram, Thalupulamma Thalli and Rajahmundry. Tourists better plan their stay either at Kakinada, Samalkot or Rajahmundry. Travellers can also make Rajahmundry as the center place for their trip.